With the two sides sitting next to each other in mid-table, this clash was likely to be a close affair and for three quarters of the game it proved to be the case. To be fair, Ensians seemed to have the measure of Stockbridge, but it took a mighty long time for them to pull away from a first half 0-6 deficit. The home team were in a changed (yellow) strip and on a cold, wet, windy, cheerless day, provided an unintentional splash of colour. Ensians kicked off into the breeze, the ball held up, Stockbridge failed to gather and from the resulting scrum a penalty was awarded to the home side. The tone of the ensuing afternoon was somehow set by this sequence of dropped ball, scrum, penalty and the ref lecturing the two skippers. Fractious and fragmented, the game saw too much failure to control possession and cold fingers, rain and strong wind all contributed to spilled ball. Nevertheless, both teams threw it around, Ensians because the conditions made kicking out of defence difficult and Stockbridge who chose to run rather than use the elements to gain territory. Ensians were stealing line-out ball, but did not manage to see much of their opponents’ half of the field as Stockbridge regained possession and ran it back at them. After 10 minutes the home side were penalised in front of their posts and the simple kick put them 0-3 down. The referee warned them after they had conceded “3 silly penalties” and the stop-start game continued. Stockbridge were taking quick tap penalties, but Ensian tackling was sound and they looked in little danger of leaking tries. Conditions underfoot were very good, but careless passing by both sides was frustrating efforts to keep the game open. Matters weren’t helped by the referee “needing” to speak frequently to the captains and so interrupting the flow of the play. Excellent work between winger Connor Bateman and full back will cooper enabled a Stockbridge kick and chase to be dealt with by the former turning quickly and winning the foot race to gather and pass to the supporting cooper, who cleared with a great kick to touch. On the half hour Ensians conceded a kickable penalty which was indeed converted to give the visitors a 6 point lead. The restart led to a barging offence off the ball, another penalty to Stockbridge and yet another telling off for skipper Sam Featherstone. 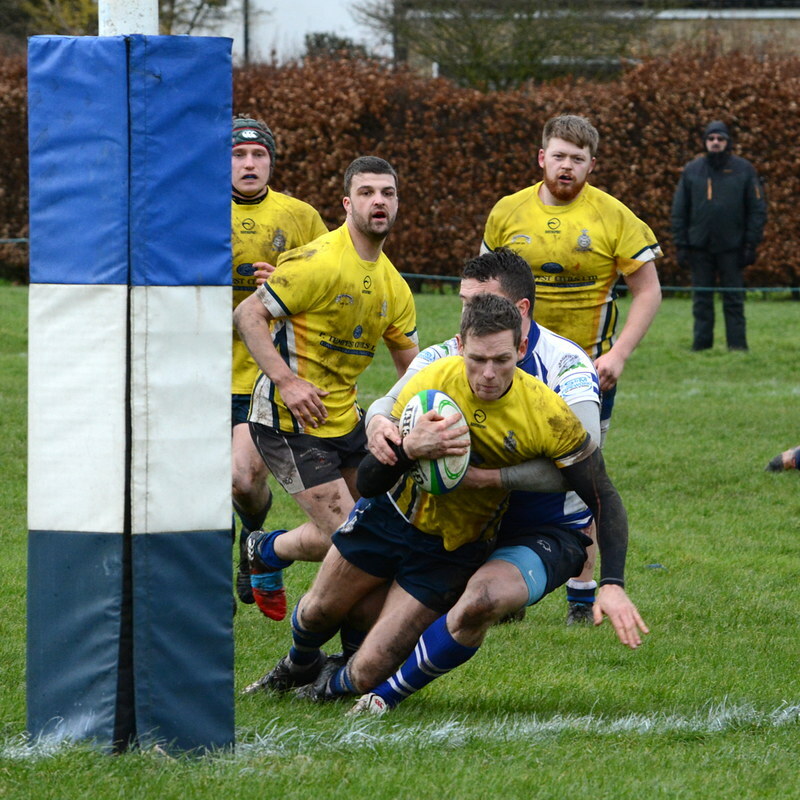 Ensians had to scramble in defence to keep Stockbridge at bay before the interval but ought to have scored themselves after sustained pressure at the other end. Another spilt ball and a clearance kick took the visitors out of that danger to the safety of half time. 6 nil did not look enough though. The second half restart repeated that of the opening kick-off, but the home side soon regained possession and used the wind to put boot to ball and play in “the right areas”. Kristian Keinhorst had been kicking well out of hand into the wind, but was now able to keep up the pressure, with Stockbridge finding life difficult. A massive flare-up on the visitors’ 22 metre touch- line saw “off-field” people involved on the pitch with fighting players, the language was dreadful and the ref did not really take control. Both red and yellow cards were clearly appropriate, but neither were issued and after a lengthy delay the game resumed. In fact there were no further incidents, but the matter may well be the subject of a referee’s report. Ensians continued to press, but a good attack failed when the final pass to the wing was forward and in any event too early to put the man cleanly away. Stoppages for injuries were frequent and the game really required a spark from Ensians to put some points on the board. Then, some good handling, men drawn, passes given, made a try for nick Keinhorst and gave positive confidence to the home side. Although still behind, a win looked “on”. Continued pressure in the Stockbridge 22, good ball retention provided another try-scoring chance and Kristian Keinhorst dummied, cut back inside and touched down near the posts (The multi-man overlap deserves a tongue- in -cheek mention!!) The conversion of his own try took the score to 12-6 and Stockbridge were struggling. A great kick by nick Keinhorst put the home side in another attacking position. A penalty and kick into the corner led to typically clean, quick line- out ball from Featherstone and a try wide out for Ali Campbell. A fine conversion from Kristian Keinhorst gave Ensians a 19-6 win. This was a less-than-memorable game, marred certainly by “the incident”, but you can’t argue with the workmanlike, “job-done” result.